To be fair, Dominic Sena’s Season of the Witch may have sounded good on paper, it’s just that the execution lets it down. 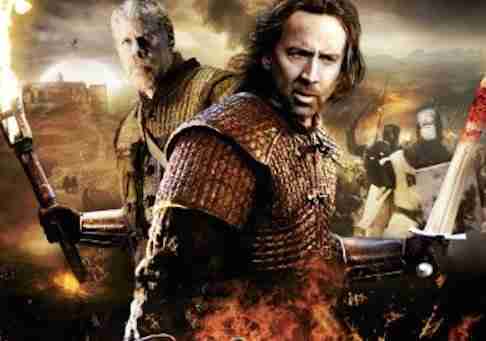 The plot of Season of the Witch is simple; Cage and his partner Ron Perlman go AWOL from the Crusades after realizing that they have seen too many innocent people slaughtered. Returning to their homeland (looking surprisingly like Bulgaria) they are exposed as deserters and given one choice by the Church – transport a girl (Claire Foy) who may or may not be a witch, across the country so that she can stand trial in an attempt to eradicate the bubonic plague or they can die. They obviously choose the latter and soon our heroes are on their merry way with the aforementioned girl and an odd cabal featuring a potentially evil priest (Stephen Campbell Moore), a young boy seeking adventure (Robert Sheehan), a guard (Ulrich Thomsen) and a bumbling guide (Stephen Graham). Depending on your point of view, Season of the Witch was either terribly underfunded or it had too much money lavished upon it. It would have worked well as a low budget fantasy/ horror if they’d ditched the CGI in favour of a more economical style of storytelling where they used their (admittedly beautiful) Eastern European locales to the extreme and upped the horror quota. It still would have been a schlocky affair, akin to the mid-eighties Sean Connery effort The Sword of the Valiant, only with added gore. Instead Sena and company decided they wanted to create a huge fantasy/horror/adventure/ action film – think Kingdom of Heaven meets Lord of the Rings – however the budget just doesn’t stretch. Season of the Witch features some of the worst computer effects featured in mainstream film in long time, with the opening Crusades section looking horrendous, in fact, the film would have benefitted if the entire segment had of been cut. John Ford didn’t need to show the American Civil War at the beginning of The Searchers, and the Crusades don’t need to be shown in their pixelated glory here, a few lines of expository dialogue would have sufficed, leaving more room for a bit of character development. The decision to aim the film at the teenage market was another failure, but as it stands, no self respecting grown-up is going to rush out to watch this. Sena’s Swordfish was a visual treat – possibly having the best post-Matrix bullet-time moment out of a multitude of imitators, while his first trip around the block with Cage with Gone In Sixty Seconds had some impressive cinematography and energetic editing. However, here Sena’s heart doesn’t seem to be in it and he appears to have left his clever filmmaking tools at home. Staid camera work and an unhealthy mix of soundstages and the outdoors make this look like an amateur affair. The performances aren’t much to write home about either. Cage turns in a sedated performance, looking like Nickleback’s Chad Kroeger in another interestingly styled toupee, while Perlman delivers another one of his trusty wisecracking tough roles that we’ve seen on a thousand B-movies. The main set piece features our team of intrepid adventurers as they try to get a horse and carriage over a crumbling rope bridge. It’s a sequence that’s been a staple of many movies, and it’s oddly the best executed scene in the movie – with everything else paling in comparison. It’s followed by a “haunted woods” scene that features a few too many CGI wolves (not as bad as Twilight), which leads to the woefully misjudged finale. To say too much would give away something of a twist, but the climax turns into a medieval remake of The Exorcist, where Nic Cage really does “dance with the devil”. Season of the Witch is pretty much a missed opportunity on all fronts. Yes, there is the occasional moment where it comes to life, and a brief Christopher Lee cameo probably makes it one for genre fans to tick off their list. An uneven tone, lacklustre production values and preposterous climax make it hard to recommend. It’s really a film for fans of Nicolas Cage and his hair. This Blu-ray doesnt offer much in way of supplementary material. A plot heavy trailer and a brief “making of” is your lot. The making of is something of an oddity, as if the filmmakers truly believe that they’re making something worthwhile. Producer Charles Roven either appears to be either; a) talking about a totally different film b) deluded or c) going to be very disappointed when he see the finished product and realizes that something went awry during production. Great Trailer For Brit Werewolf Horror HOWL: Could It Be The New Dog Soldiers?